Not much was changed about the ex-CN 110, an MLW S13. The CN noodle shines through the black paint. Port Colborne, June 3rd, 2000. 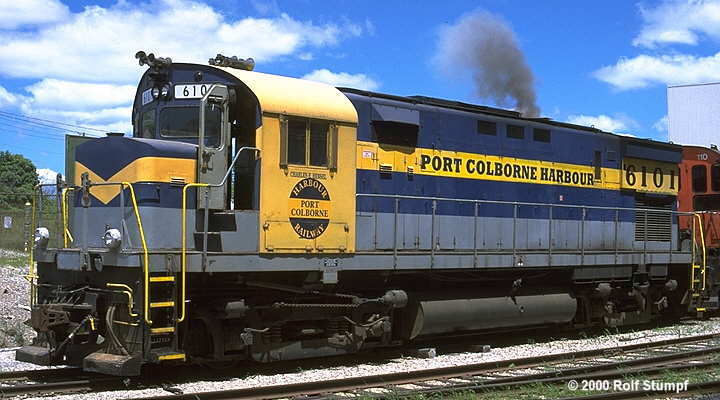 Trillium Railway owns and operates the PCHR (except trackage at Port Colborne which is owned by the City of P.C. ), but most units are labelled with the Trillium Railway logo except the S-1 and the C-425 which returned to the USA when the ownership Trillium Railway went 100 % Canadian in 2003. The current PCHR units (S13 nos. 108 and 110) are now based at Feeder yard near Wainfleet. The two jobs (Port and Merriton) start here. 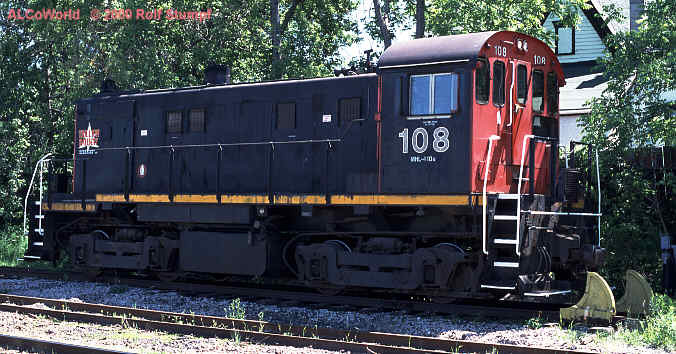 In June 2000 I found S-13 117 and slug 168 stored at ADM Port Colborne (together with an unmarked yellow GE 45ton). The 117 will spend its engine block for a newly acquired S13. The slug has seen some service since but doesn't run properly. The PCHR will operate passenger service twice a day on Sundays through the summer. Another Trillium unit (M420 no. 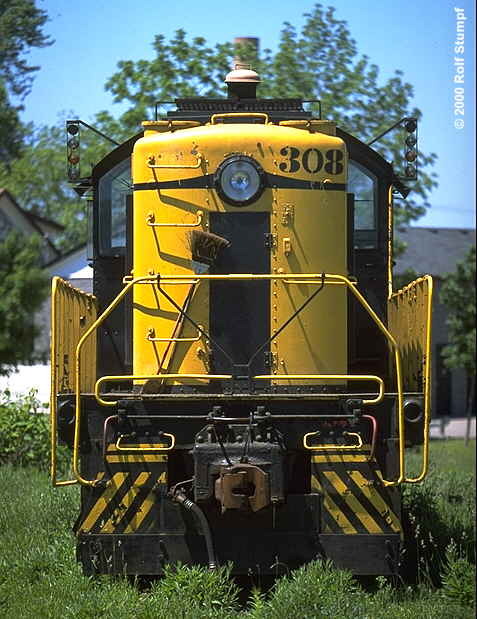 3568) was used around Tillsonburg ON for the St. Thomas & Eastern. It's now replaced by former Railink/Timber Train BBD HR412 #3582. Last winter OSR 183 (RS18) was leased for power. 1946 vintage ALCo S1 #308 was stored at St. Catharines on June 3rd, 2000. It returned to the USA meanwhile. 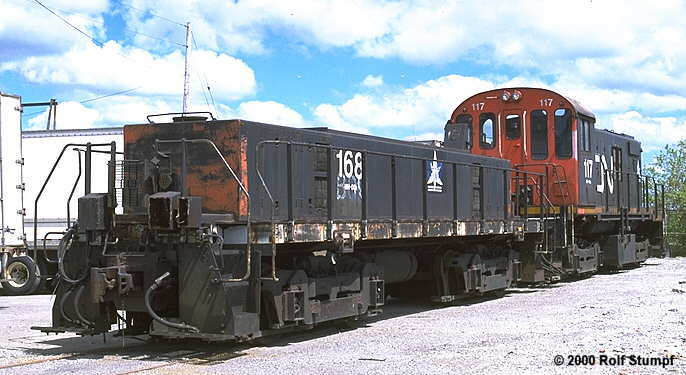 S13 117 (without control stand) and slug 168 (ex S3) stored at Port Colborne Harbour, ADM plant. June 3rd, 2000. S13 108 at St. Catharines, June 3rd, 2000. C425 no. 6101 is fired up at Port Colborne, June 3rd, 2000. The unit is now with the New York & Lake Erie.